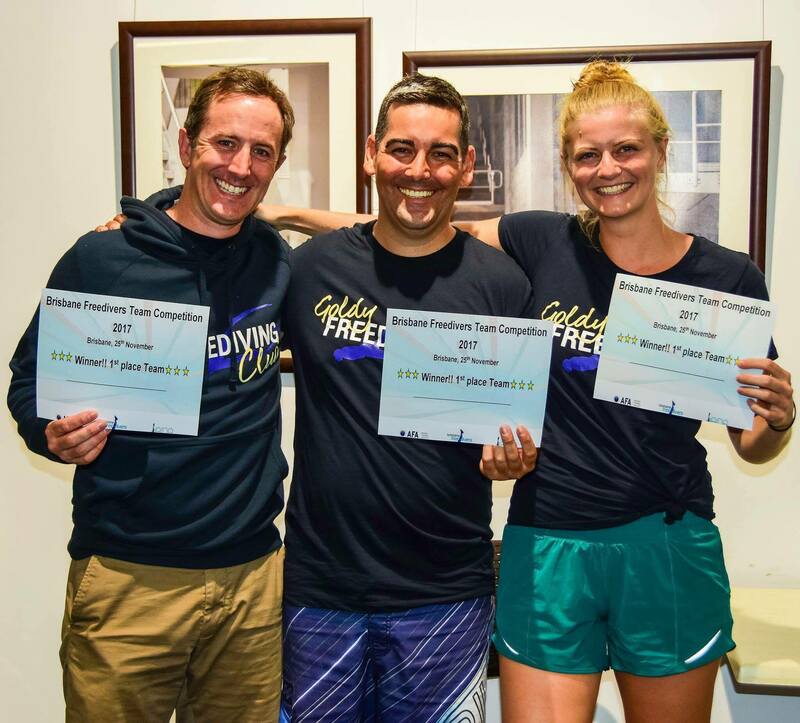 The Brisbane Freedivers held its second Club Team Competition on the 25th of November, 2017 at the Sleeman Sports Complex. The event was structured as a team competition where each team was made up of three athletes and each athlete competed in 2 of the 3 disciplines (STA, DYN, DNF). A total of 15 local and interstate athletes (5 teams) competed in a fun and relaxed atmosphere. The winner of the comp was the Team Goldy’s (Gavin Philips, Andrew Bain, and Estelle Leray) who finished strong with white cards for all of the team members’ performances. 2nd place was taken by one of the Brisbane teams (Lewis Jones, Aya Mizumura, Ryan Beecroft) who managed to collect enough points after an unfortunate red card in the STA event. 3rd place went to the Team Melbourne (Alan Maddick, Damian Hector, Jarrod Briffa). 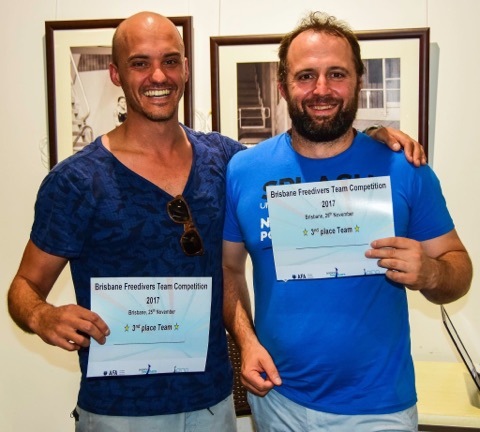 The competition clearly showed the importance of getting a white card in a team event – you need white cards to stay in the game! The competition also provided a great opportunity for newcomers to test their skills and gain confidence. The male and female overall winner’s title was taken by Ryan Beecroft and Estelle Leray, respectively. 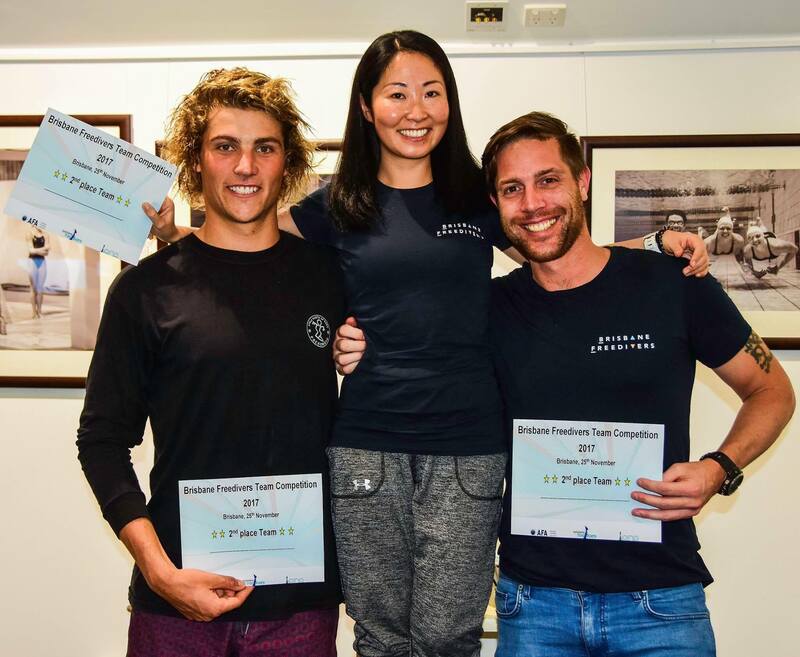 Though it was the first freediving competition the pair have participated in, they both showed strong skills and potential for growth. Brisbane Freedivers train regularly at the Sleeman Sports Complex. If you wish to join, contact the club.